Last year the 3.8 billion people who make up the poorest half of the world saw their wealth decline by 11 per cent, while billionaires’ fortunes rose by a similar amount (12 per cent). 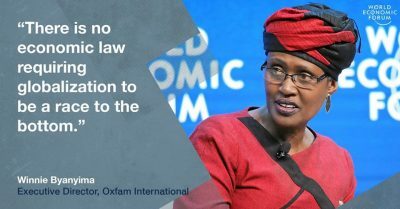 As the elite meet in Davos, Oxfam has called on governments to address rising inequality as well as tax avoidance among the world’s richest. During this week, when political and business leaders, including Ireland’s Taoiseach and Minister for Finance, are at the World Economic Forum in Davos, Switzerland, a new report from Oxfam shows that the global economy favours those at the top, while people living in poverty get poorer. It finds that almost half the world’s population live on less than €5/£5 per day, while the wealth of the world’s billionaires increased by €2.2billion/£1.9billion per day in 2018 alone. The report – titled Public Good or Private Wealth? – states that last year the 3.8 billion people who make up the poorest half of the world saw their wealth decline by 11 per cent while billionaires’ fortunes rose by a similar amount (12 per cent). “Halving extreme poverty is one of our greatest global achievements over the last 30 years but this is being jeopardised by rising inequality. Our report shows how decades of progress in reducing global poverty has disturbingly slowed – the rate of reduction has halved since 2013 – with extreme poverty actually increasing in sub-Saharan Africa,” said Jim Clarken, Chief Executive, Oxfam Ireland. The report states that while the number of billionaires has doubled since the financial crisis, the super-rich and corporations are paying lower rates of tax than they have in decades. The report writers assert that if the richest 1 per cent paid just 0.5 per cent extra tax on their wealth, this could raise more money than it would cost to educate 262 million children who are out of school and provide healthcare that would save the lives of 3.3 million people. “Tax avoidance by big businesses and wealthy individuals is depriving developing countries of US$170 billion every year. By eliminating tax avoidance and agreeing a new set of rules to make the global tax system fairer, governments, including the Irish and UK governments, can ensure more money is spent on providing free universal public services that reduce inequality and enable people to thrive – and in many cases survive,” said Jim Clarken. • that everyone, including big businesses and wealthy individuals, pay their fair share of tax. Ways to achieve this include new rules to ensure that developing countries having an equal seat at the table, that there is increased transparency in multinational corporations’ (MNCs) tax affairs, and that effective mechanisms to end profit shifting by MNCs at home and abroad are implemented. 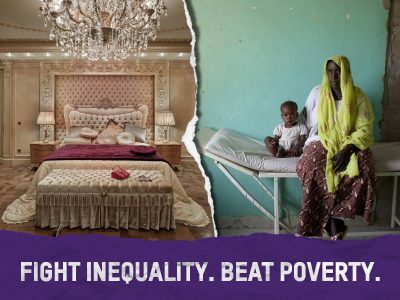 “Unless our leaders at home and across the world act now to reduce inequality, the global goal agreed by world leaders to end extreme poverty by 2030 remains out of reach. But it doesn’t have to be this way – there is enough wealth in the world to provide everyone with a fair chance in life,” said Jim Clarken. He added that this would result in working taps and toilets that don’t spread cholera and deadly disease; clinics with nurses, doctors, equipment and drugs; classrooms with teachers and supplies; and a pension at the end of a hard-working life. Oxfam’s calculations are based on global wealth distribution data provided by the Credit Suisse Global Wealth Data book published in November 2018. These data relate to the period June 2017 to June 2018. The wealth of billionaires was calculated using the annual Forbes Billionaires list last published in March 2018.
Credit Suisse has improved and expanded its data set, which means Oxfam can recalculate figures for previous years. Doing this, the charity stated that last year 43 people owned the same wealth as half the world. This year it is 26, while the year before last it was 61. See report, methodology and data sources on: https://www.oxfamireland.org/blog/public-good-or-private-wealth.